Offering the ideal pairings of nibs and holders that are specifically catered to suit a range of drawing or lettering projects, Speedball Pen Sets provide a convenient and value-priced means to stock (or re-stock!) your artist toolbox. Love the Speedball Super Pigmented Inks? 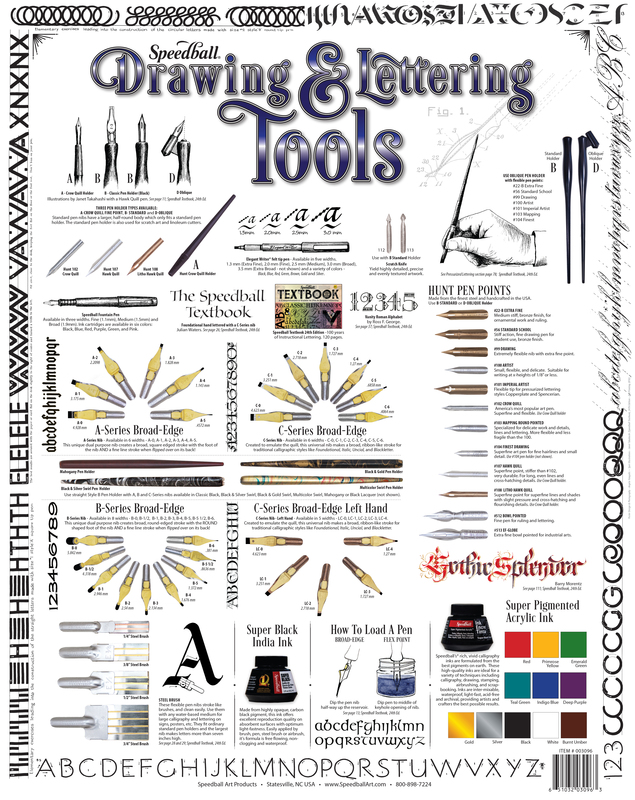 The Speedball Pen & Ink or Signature Series® Sets are just for you! The perfect addition to any drawing or lettering artist's collection, each of these great sets includes the nibs and holders noted below and all is housed in a convenient, hard plastic storage case for keeping your nibs and holders safe between uses. Calligraphy Pen Set: Contains (4) C-Series nibs (C1, C2, C3, C4), (2) pointed pen nibs (#101, #512) and (1) Standard Penholder. Sketching Pen Set: Features (6) pointed pen nibs (#56, #99, #102, #107, #108, #512), (1) Standard Penholder and (1) Crowquill Holder. No. 5 Artist Pen Set: Contains (3) B-Series nibs (B1, B3, B5) and (3) C-Series nibs (C0, C2, C4) along with (3) pointed pen nibs (#56, #102, #513EF). Also includes (1) Standard Penholder and (1) Crowquill Holder. Oblique Pen Set: Includes (4) #101 and (2) #103 pointed pen nibs along with (1) Oblique Penholder. Poster Pen Set: Contains (3) A-Series nibs (A1, A3, A5) and (3) B-Series nibs (B1, B3, B5) along with (1) Standard Penholder. No. 20 General Purpose Pen Set: Features (1)ea. of the following Pointed pen nibs: #100, #102, #103, #104, #107, #108. Also includes (1) Standard Penholder and (1) Crowquill Penholder. Mapping Pen Set: Includes (6) pointed pen nibs (#99, #100, #103, #104, #512, #513EF) along with (1) Standard Penholder and (1) Crowquill Penholder. Cartooning Pen Set: Contains (4) B-Series nibs (B1, B3, B5, B6), (2) pointed pen nibs (#100, #512), (1) Standard Penholder and (1) Crowquill Penholder. 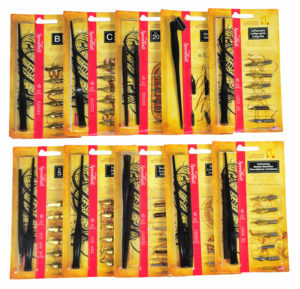 B-Series Set: Includes (6) B-Series nibs (B0, B1, B2, B3, B4, B5) and (1) Standard Penholder. C-Series Set: Features (6) C-Series nibs (C0, C1, C2, C3, C4, C5) and (1) Standard Penholder. Also available in left-handed version that includes (6) pen nibs (LC0, LC1, LC2, LC3, LC4 and #513EF) with (1) Standard Penholder. #102 Crowquill Set: Includes (12) #102 Crowquill pointed pen nibs along with (12) #102 Crowquill Penholders. #107 Hawk Quill Set: Contains (12) #107 Hawk Quill pointed pen nibs along with (12) Crowquill Penholders. Includes (1)ea. of the following: #102 Crowquill pointed pen nib; #102 Crowquill Penholder; 12ml Super Pigmented Acrylic Ink (available with either Black or Gold ink featured).